On a stormy afternoon in early March, a pickup truck traveling at highway speeds slammed into the back of a Ford Explorer carrying Justin and Cathy Walters (CIM Indianapolis). The pickup shoved the Explorer forward, lodging it beneath the back of a semi. The Explorer’s windshield shattered; its hood crumpled like paper. But Justin and Cathy, their car smashed between two vehicles, escaped unharmed except for minor whiplash. Justin and Cathy were driving to North Carolina to visit Justin’s two sisters and their families on Friday, March 2. They passed through storms in Kentucky that reduced visibility and caused slick spots on the road. An accident ahead of them halted traffic on I-75, creating a long line of stopped vehicles. A semi sat at the end of the line and Justin stopped behind it. The Explorer came to a halt. Its airbags deployed. People got out of their cars and offered help, encouragement and prayer. Several witnesses described the events to the police. The driver of the pickup apologized for failing to stop in time, and Justin and Cathy offered their forgiveness. An ambulance brought Justin and Cathy to a hospital for X-Rays and CAT scans, but the tests showed no serious injuries. After several hours–spent mostly contacting family and friends–they were released. The Walterses’ insurance company declared the Explorer totaled, offering them a generous settlement that has helped them buy a new car. “God’s angels must have been busy looking after us,” says Cathy. Thanks for sharing the story with us all. This makes me treasure Cathy and Justine more than ever. So thankful. Praise be to God for his great Mercy! We pray for continued healing for you! Yes, thaaaank you, Lord!!! Amazing!!! The video tells it all. The Lord was with you! Our God is wonderful! What a great story of how the Lord protects us! Praise the Lord for HIS goodness and mercy to you both! We are so grateful to the Lord that you are OK. Your folks told us about the accident and we have been praising God for your lives being spared as well as any serious injury. Glory! God's love is powerful! We love you two, so are glad the Lord didn't send you off to your next assignment yet! Alleluia!! 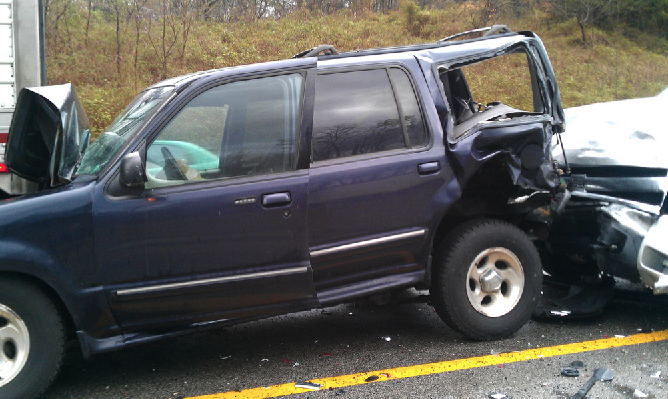 My daughter Miriam just walked away from a two-vehicle, airbag-deploying crash that totalled her Sentra. I am very grateful to God that she and you, Justin & Cathy, are OK. Whew! Thank you Lord for your saving mercies ! Thank you Justin & Cathy for your life in CIM ! Thank you Publications for the good coverage ! Your Mom told me about the accident on our walk one evening. Indeed, may the name of the Lord our God be praised. Once again we are reminded of his mercy and loving protection day in and day out. Thank you Lord, Thank you Lord, Thank you Lord that the two of you walked away with little or no injury. Our God is so GOOD! Thanks be to God you two are safe and sound! Our Father cares for his sons an daughters in miraculous ways. Amazing grace! Our God reigns. Glory to God! We are praising him for sparing you both! Thank you for sharing the story. Thank you Lord for watching over your people and keeping them safe from harm. After watching the video I know Our Father keeps you (and all of us) "in the palm of His hand." I am so grateful for your saftey. I am SO grateful for God's mercy to all of us by keeping you safe! Thank you, Lord! Chris & team, thanks for sharing our good news with the community! Praise God! We're so thankful for all of the Lord's workers, from the good samaritans that showed up immediately after the accident, to our family & CIM members who were immediately praying for us and who wanted to drop everything and drive 4+ hours to pick us up, to Rich Was and the quick, compassionate response of his auto insurance staff, to Geoff Kelleher who helped us quickly find a replacement vehicle! The kingdom of God may have car accidents, but it also has legions of saints and angels! Still marvelling at this a few weeks later. Praise God for his love, mercy, and protection! And praise God for His work in the People of Praise that draws us together to share our lives.